The National Curriculum is composed of The New Zealand Curriculum and Te Marautanga o Aotearoa which set the direction for student learning and provide guidance for schools as they design and review their curriculum. Although both come from different perspectives, each start with a vision of young people developing the competencies they need for study, work, and lifelong learning, so they may go on to realise their potential. Please note the NZC achievement objectives are provided separately. They can be downloaded by level or learning area. It is my pleasure to introduce this revision of the New Zealand Curriculum. Like its predecessors, it is the work of many people who are committed to ensuring that our young people have the very best of educational opportunities. The previous curriculum, implemented from 1992 onwards, was our first outcomes-focused curriculum: a curriculum that sets out what we want students to know and to be able to do. Since it was launched, there has been no slowing of the pace of social change. Our population has become increasingly diverse, technologies are more sophisticated, and the demands of the workplace are more complex. Our education system must respond to these and the other challenges of our times. For this reason, a review of the curriculum was undertaken in the years 2000–02. Following this review, Cabinet agreed that the national curriculum should be revised. A widely representative reference group oversaw a development process that included trials in schools, collaborative working parties, online discussions, and an inquiry into relevant national and international research. This process led to the publication of The New Zealand Curriculum: Draft for Consultation 2006. The Ministry of Education received more than 10 000 submissions in response. These were collated and analysed and were taken into consideration when the document that you now have in your hands was being written. The New Zealand Curriculum is a clear statement of what we deem important in education. It takes as its starting point a vision of our young people as lifelong learners who are confident and creative, connected, and actively involved. It includes a clear set of principles on which to base curriculum decision making. It sets out values that are to be encouraged, modelled, and explored. It defines five key competencies that are critical to sustained learning and effective participation in society and that underline the emphasis on lifelong learning. 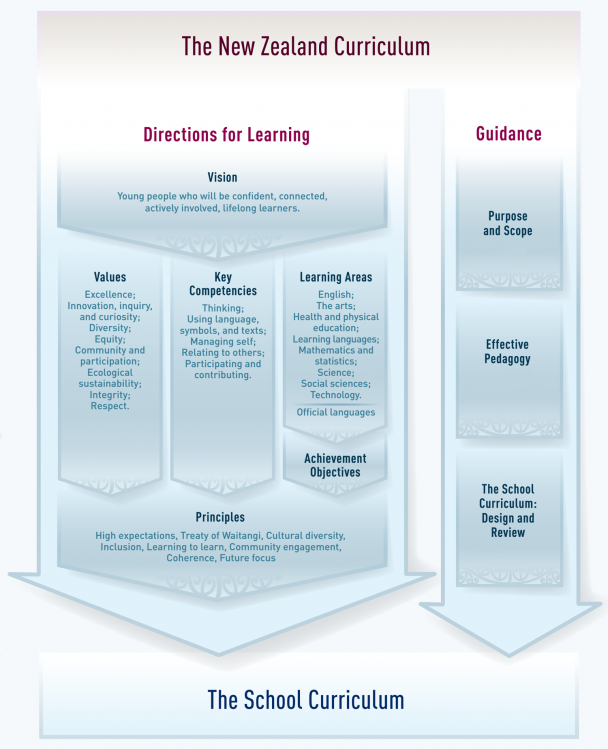 The New Zealand Curriculum states succinctly what each learning area is about and how its learning is structured. The sets of achievement objectives have been carefully revised by teams of academics and teachers to ensure that they are current, relevant, and well-defined outcomes for students. A new learning area, learning languages, has been added to encourage students to participate more actively in New Zealand’s diverse, multicultural society and in the global community. My thanks go to all who have contributed to the development of The New Zealand Curriculum: members of the reference group, teachers, principals, school boards, parents, employer representatives, curriculum associations, education sector bodies, academics, and the wider community. You can be proud of the part you have played in creating this sound framework for teaching and learning; a framework designed to ensure that all young New Zealanders are equipped with the knowledge, competencies, and values they will need to be successful citizens in the twenty-first century. The challenge now is to build on this framework, offering our young people the most effective and engaging teaching possible and supporting them to achieve to the highest of standards. The New Zealand Curriculum is a statement of official policy relating to teaching and learning in English-medium New Zealand schools. Its principal function is to set the direction for student learning and to provide guidance for schools as they design and review their curriculum. A parallel document, Te Marautanga o Aotearoa, will serve the same function for Māori-medium schools. Although they come from different perspectives, both start with visions of young people who will develop the competencies they need for study, work, and lifelong learning and go on to realise their potential. Together, the two documents will help schools give effect to the partnership that is at the core of our nation’s founding document, Te Tiriti o Waitangi/the Treaty of Waitangi. The New Zealand Curriculum applies to all English-medium state schools (including integrated schools) and to all students in those schools, irrespective of their gender, sexuality, ethnicity, belief, ability or disability, social or cultural background, or geographical location. The term “students” is used throughout in this inclusive sense unless the context clearly relates to a particular group. Schools that also offer Māori-medium programmes may use Te Marautanga o Aotearoa as the basis for such programmes. This diagram provides links to the various sections of The New Zealand Curriculum. who will be confident, connected, actively involved, and lifelong learners. The principles set out below embody beliefs about what is important and desirable in school curriculum – nationally and locally. They should underpin all school decision making. These principles put students at the centre of teaching and learning, asserting that they should experience a curriculum that engages and challenges them, is forward-looking and inclusive, and affirms New Zealand’s unique identity. Although similar, the principles and the values have different functions. The principles relate to how curriculum is formalised in a school; they are particularly relevant to the processes of planning, prioritising, and review. The values are part of the everyday curriculum – encouraged, modelled, and explored. The curriculum supports and empowers all students to learn and achieve personal excellence, regardless of their individual circumstances. The curriculum acknowledges the principles of the Treaty of Waitangi, and the bicultural foundations of Aotearoa New Zealand. All students have the opportunity to acquire knowledge of te reo Māori me ōna tikanga. The curriculum encourages all students to reflect on their own learning processes and to learn how to learn. Develop deeper thinking around the NZC principles within a school curriculum. Use the NZC principles to examine teaching and learning at your school and to guide future decision making. Waitangi Day – how will you commemorate? Values are deeply held beliefs about what is important or desirable. They are expressed through the ways in which people think and act. The values on the list below enjoy widespread support because it is by holding these values and acting on them that we are able to live together and thrive. The list is neither exhaustive nor exclusive. All the values listed above can be expanded into clusters of related values that collectively suggest their fuller meanings. For example, "community and participation for the common good" is associated with values and notions such as peace, citizenship, and manaakitanga. Te reo Māori and New Zealand Sign Language (NZSL) are official languages of New Zealand (The Māori Language Act 1987 and the New Zealand Sign Language Act 2006). English, the medium for teaching and learning in most schools, is a de facto official language by virtue of its widespread use. For these reasons, these three languages have special mention in The New Zealand Curriculum. All three may be studied as first or additional languages. They may also be the medium of instruction across all learning areas. Requirements for the teaching of English are outlined in the English learning area section. Guidelines specific to the learning of te reo Māori and NZSL (published separately) provide detailed information for schools that choose to offer them. Ko tōku nui, tōku wehi, tōku whakatiketike, tōku reo. te huarahi i te ao tūroa. By learning te reo and becoming increasingly familiar with tikanga, Māori students strengthen their identities, while non-Māori journey towards shared cultural understandings. All who learn te reo Māori help to secure its future as a living, dynamic, and rich language. As they learn, they come to appreciate that diversity is a key to unity. broaden their entrepreneurial and employment options to include work in an ever-increasing range of social, legal, educational, business, and professional settings. Unique to New Zealand, NZSL is a complete visual-gestural language with its own grammar, vocabulary, and syntax. Like other signed languages, it uses the hands, the body, and facial expressions (including lip patterns) to express meaning and the eyes to perceive meaning. Like any language, it is capable of communicating an infinite number of ideas. Face-to-face interaction is particularly important in NZSL because it has no written form. There are, however, notation systems that are used for recording signs on paper. NZSL is primarily used by members of New Zealand’s deaf community and those affiliated in some way with this community, for example, hearing people who have deaf relatives or people (such as interpreters) who work with deaf people. For many deaf people, NZSL is essential for effective daily communication and interactions. New Zealand needs more people who are fluent users of the language and who have an appreciation of deaf culture. By learning NZSL, hearing students are able to communicate with their deaf peers and participate in the deaf community. Skilled communicators may find career opportunities that involve working with Deaf people. As deaf people come to have a wider circle to converse with, our society becomes more inclusive. Learning NZSL can be a positive and enriching experience for both deaf and hearing people of any age. By learning NZSL, deaf children and hearing children of deaf parents gain a sense of belonging in the deaf community. For hearing students who wish to learn a second or subsequent language, NZSL may be offered as another option alongside the spoken languages offered by their school. In such cases, schools need to consult with their deaf communities and ensure that, wherever possible, students have access to deaf role models with NZSL as their first language. Learners need to have opportunities for sustained conversations with other users of NZSL, and they need to be exposed to language role models in a variety of situations. Each learning area has its own language or languages. As students discover how to use them, they find they are able to think in different ways, access new areas of knowledge, and see their world from new perspectives. Learning is inseparable from its social and cultural context. Students learn best when they feel accepted, when they enjoy positive relationships with their fellow students and teachers, and when they are able to be active, visible members of the learning community. Effective teachers foster positive relationships within environments that are caring, inclusive, non-discriminatory, and cohesive. They also build good relationships with the wider school community, working with parents and caregivers as key partners who have unique knowledge of their children and countless opportunities to advance their children’s learning. Effective teachers attend to the cultural and linguistic diversity of all their students. The classroom culture exists within and alongside many other cultures, including the cultures of the wider school and the local community, the students’ peer culture, and the teacher’s professional culture. Students learn most effectively when they understand what they are learning, why they are learning it, and how they will be able to use their new learning. Effective teachers stimulate the curiosity of their students, require them to search for relevant information and ideas, and challenge them to use or apply what they discover in new contexts or in new ways. They look for opportunities to involve students directly in decisions relating to their own learning. This encourages them to see what they are doing as relevant and to take greater ownership of their own learning. Students learn best when they are able to integrate new learning with what they already understand. When teachers deliberately build on what their students know and have experienced, they maximise the use of learning time, anticipate students’ learning needs, and avoid unnecessary duplication of content. Teachers can help students to make connections across learning areas as well as to home practices and the wider world. In this teaching inquiry, the teacher uses evidence from research and from their own past practice and that of colleagues to plan teaching and learning opportunities aimed at achieving the outcomes prioritised in the focusing inquiry. prioritised outcomes, using a range of assessment approaches. They do this both while learning activities are in progress and also as longer-term sequences or units of work come to an end. They then analyse and interpret the information to consider what they should do next. See The school curriculum: design and review for a discussion of purposeful assessment. enhance opportunities to learn by offering students virtual experiences and tools that save them time, allowing them to take their learning further. Schools should explore not only how ICT can supplement traditional ways of teaching but also how it can open up new and different ways of learning. Curriculum design and review is a continuous, cyclic process. It involves making decisions about how to give effect to the national curriculum in ways that best address the particular needs, interests, and circumstances of the school’s students and community. It requires a clear understanding of the intentions of The New Zealand Curriculum and of the values and expectations of the community. Above all, it clarifies priorities for student learning, the ways in which those priorities will be addressed, and how student progress and the quality of teaching and learning will be assessed. Curriculum change should build on existing good practice and aim to maximise the use of local resources and opportunities. Curriculum is designed and interpreted in a three-stage process: as the national curriculum, the school curriculum, and the classroom curriculum. The national curriculum provides the framework and common direction for schools, regardless of type, size, or location. It gives schools the scope, flexibility, and authority they need to design and shape their curriculum so that teaching and learning is meaningful and beneficial to their particular communities of students. In turn, the design of each school’s curriculum should allow teachers the scope to make interpretations in response to the particular needs, interests, and talents of individuals and groups of students in their classes. All New Zealand students, regardless of where they are situated, should experience a rich and balanced education that embraces the intent of the national curriculum. The principles should underpin and guide the design, practice, and evaluation of curriculum at every stage. The values, key competencies, and learning areas provide the basis for teaching and learning across schools and within schools. This learning will contribute to the realisation of a vision of young people who will be confident, connected, actively involved, lifelong learners. 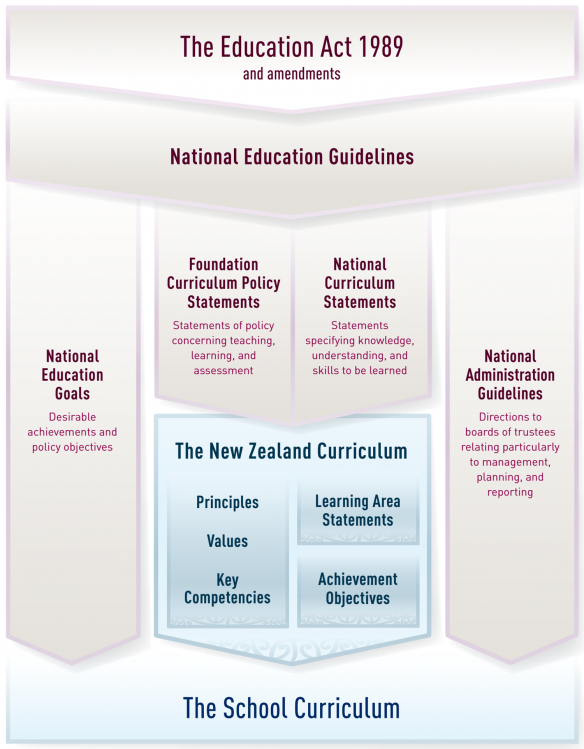 Schools are required to base their curriculum on the principles of The New Zealand Curriculum, to encourage and model the values, and to develop the key competencies at all year levels. In years 1–10, schools are required to provide teaching and learning in English, the arts, health and physical education, mathematics and statistics, science, the social sciences, and technology. The principles are foundations of curriculum decision making. They embody beliefs about the nature of the educational experience and the entitlement of students; they apply equally to all schools and to every aspect of the curriculum. Schools should be able to clearly demonstrate their commitment to the principles and to articulate how they are given effect in teaching and learning. The New Zealand Curriculum identifies values to be encouraged and modelled and to be explored by students, key competencies that students will develop over time and in a range of settings, and learning areas that describe what they will come to know and do. Schools need to consider how each of these aspects of the curriculum will be promoted and developed in teaching and learning. They can do this in different ways. Schools may, for example, decide to organise their curriculum around one of these three aspects (values, key competencies, or learning areas) and deliberately weave the other two through their programmes. Alternatively, they may decide to organise their curriculum around central themes, integrating values, key competencies, knowledge, and skills across a number of learning areas. Or they may use another approach or a combination of approaches. The values, competencies, knowledge, and skills that students will need for addressing real-life situations are rarely confined to one part of the curriculum. Wherever possible, schools should aim to design their curriculum so that learning crosses apparent boundaries. Every school has a set of values. They are expressed in its philosophy, in the way it is organised, and in interpersonal relationships at every level. Following discussions with their communities, many schools list their values in their charters. The New Zealand Curriculum identifies a number of values that have widespread community support. These values are to be encouraged and modelled, and they are to be explored by students. Schools need to consider how they can make the values an integral part of their curriculum and how they will monitor the effectiveness of the approach taken. The key competencies are both end and means. They are a focus for learning – and they enable learning. They are the capabilities that young people need for growing, working, and participating in their communities and society. The school curriculum should challenge students to use and develop the competencies across the range of learning areas and in increasingly complex and unfamiliar situations. Opportunities for doing this can often be integrated into existing programmes of work. Use can also be made of opportunities provided by the ways in which school environments and events are structured. There will be times when students can initiate activities themselves. Such activities provide meaningful contexts for learning and self-assessment. create texts to record and communicate ideas, using language and symbols appropriate to the relevant learning area(s) (using language, symbols, and texts). When designing and reviewing their curriculum, schools will need to consider how to encourage and monitor the development of the key competencies. They will need to clarify their meaning for their students. They will also need to clarify the conditions that will help or hinder the development of the competencies, the extent to which they are being demonstrated, and how the school will evaluate the effectiveness of approaches intended to strengthen them. With appropriate teacher guidance and feedback, all students should develop strategies for self-monitoring and collaborative evaluation of their performance in relation to suitable criteria. Self-assessments might involve students examining and discussing various kinds of evidence, making judgments about their progress, and setting further goals. The learning area statements describe the essential nature of each learning area, how it can contribute to a young person’s education, and how it is structured. These statements, rather than the achievement objectives, should be the starting point for developing programmes of learning suited to students’ needs and interests. Schools are then able to select achievement objectives to fit those programmes. None of the strands in the required learning areas is optional, but in some learning areas, particular strands may be emphasised at different times or in different years. Schools should have a clear rationale for doing this and should ensure that each strand receives due emphasis over the longer term. develop students’ financial capability, positioning them to make well-informed financial decisions throughout their lives. Future-focused issues are a rich source of learning opportunities. They encourage the making of connections across the learning areas, values, and key competencies, and they are relevant to students’ futures. The achievement objectives found in The New Zealand Curriculum set out selected learning processes, knowledge, and skills relative to eight levels of learning. These desirable levels of knowledge, understanding, and skills represent progress towards broader outcomes that ultimately amount to deeper learning. When designing and reviewing their curriculum, schools choose achievement objectives from each area to fit the learning needs of their students. Some achievement objectives relate to skills or understandings that can be mastered within a particular learning level. Others are more complex and are developed with increasing sophistication across a number of learning levels. The broader and more complex an objective, the more significant it is likely to be for a student’s learning. It is important for both planning and teaching purposes that schools provide clear statements of learning expectations that apply to particular levels or across a number of levels. These expectations should be stated in ways that help teachers, students, and parents to recognise, measure, discuss, and chart progress. the long view is taken: each student’s ultimate learning success is more important than the covering of particular achievement objectives. Curriculum design and practice should begin with the premise that all students can learn and succeed (see the high expectations principle) and should recognise that, as all students are individuals, their learning may call for different approaches, different resourcing, and different goals (see the inclusion principle). The primary purpose of assessment is to improve students’ learning and teachers’ teaching as both student and teacher respond to the information that it provides. With this in mind, schools need to consider how they will gather, analyse, and use assessment information so that it is effective in meeting this purpose. Assessment for the purpose of improving student learning is best understood as an ongoing process that arises out of the interaction between teaching and learning. It involves the focused and timely gathering, analysis, interpretation, and use of information that can provide evidence of student progress. Much of this evidence is “of the moment”. Analysis and interpretation often take place in the mind of the teacher, who then uses the insights gained to shape their actions as they continue to work with their students. This diagram shows the different groups of people involved in supporting students’ learning and the purposes for which they need assessment information. benefits students – It clarifies for them what they know and can do and what they still need to learn. When students see that they are making progress, their motivation is sustained and their confidence increases. is planned and communicated – Outcomes, teaching strategies, and assessment criteria are carefully matched. Students know in advance how and why they are to be assessed. The teacher’s programme planning is flexible so that they can make changes in response to new information, opportunities, or insights. is suited to the purpose – Evidence is obtained through a range of informal and formal assessment approaches. These approaches are chosen to suit the nature of the learning being assessed, the varied characteristics and experiences of the students, and the purpose for which the information is to be used. is valid and fair – Teachers obtain and interpret information from a range of sources and then base decisions on this evidence, using their professional judgment. Conclusions are most likely to be valid when the evidence for them comes from more than one assessment. Assessment is integral to the teaching inquiry process because it is the basis for both the focusing inquiry and the learning inquiry. Schools need to know what impact their programmes are having on student learning. An important way of getting this information is by collecting and analysing school-wide assessment data. Schools can then use this information as the basis for changes to policies or programmes or changes to teaching practices as well as for reporting to the board of trustees, parents, and the Ministry of Education. Assessment information may also be used to compare the relative achievement of different groups of students or to compare the achievement of the school’s students against national standards. The New Zealand Curriculum provides the basis for the ongoing development of achievement standards and unit standards registered on the National Qualifications Framework, which are designed to lead to the award of qualifications in years 11–13. These include the National Certificate of Educational Achievement and other national certificates that schools may choose to offer. The New Zealand Curriculum, together with the Qualifications Framework, gives schools the flexibility to design and deliver programmes that will engage all students and offer them appropriate learning pathways. The flexibility of the qualifications system also allows schools to keep assessment to levels that are manageable and reasonable for both students and teachers. Not all aspects of the curriculum need to be formally assessed, and excessive high-stakes assessment in years 11–13 is to be avoided. As students journey from early childhood through secondary school and, in many cases, on to tertiary training or tertiary education in one of its various forms, they should find that each stage of the journey prepares them for and connects well with the next. Schools can design their curriculum so that students find the transitions positive and have a clear sense of continuity and direction. Te Whāriki: He Whāriki Mātauranga mō ngā Mokopuna o Aotearoa, the curriculum for early childhood education, provides children with a foundation for ongoing learning. It is based on four principles: Empowerment, Holistic Development, Family and Community, and Relationships. Te Whāriki includes five curriculum strands: Exploration – Mana Aotūroa, Communication – Mana Reo, Well-being – Mana Atua, Contribution – Mana Tangata, and Belonging – Mana Whenua. Together, they provide a foundation for lifelong learning. These strands correspond to the key competencies identified in this document. This new stage in children’s learning builds upon and makes connections with early childhood learning and experiences. Teaching and learning programmes are developed through a wide range of experiences across all learning areas, with a focus on literacy and numeracy along with the development of values and key competencies. The New Zealand Curriculum allows for greater choice and specialisation as students approach the end of their school years and as their ideas about future direction become clearer. Schools recognise and provide for the diverse abilities and aspirations of their senior students in ways that enable them to appreciate and keep open a range of options for future study and work. Students can specialise within learning areas or take courses across or outside learning areas, depending on the choices that their schools are able to offer. In these years, students gain credits towards a range of recognised qualifications. Schools can extend this range by making it possible for students to participate in programmes or studies offered by workplaces and tertiary institutions. Credits gained in this way can often be later transferred to tertiary qualifications. The values and key competencies gain increasing significance for senior school students as they appreciate that these are the values and capabilities they will need as adults for successful living and working and for continued learning. Tertiary education in its various forms offers students wide-ranging opportunities to pursue an area or areas of particular interest. Some tertiary education focuses on the highly specific skills and discipline knowledge required, for example, by trades, ICT, and health professions. In other cases, the emphasis is on more broadly applicable skills and theoretical understandings, developed and explored in depth, which provide a foundation for knowledge creation. Tertiary education builds on the values, competencies, discipline knowledge, and qualifications that students have developed or gained during their school years. Recognising the importance of key competencies to success at tertiary level, the sector has identified four as crucial: thinking, using tools interactively, acting autonomously, and operating in social groups. These correspond closely to the five key competencies defined in this document. In the past, many young people finished all formal learning when they left school. Today, all school leavers, including those who go directly into paid employment, should take every opportunity to continue learning and developing their capabilities. New Zealand needs its young people to be skilled and educated, able to contribute fully to its well-being, and able to meet the changing needs of the workplace and the economy. that supports students to develop the key competencies. When designing and reviewing their curriculum, schools select achievement objectives from each area in response to the identified interests and learning needs of their students. For learning in digital technologies, schools need to provide learning opportunities in line with the progress outcomes from the technology learning area. Note: All schools with students in years 7–10 should be working towards offering students opportunities for learning a second or subsequent language. Teaching programmes should be based on the learning languages statement and the achievement objectives for this learning area. Teaching programmes for students in years 11–13 should be based, in the first instance, on the appropriate national curriculum statements. in consultation with the school’s Māori community, to develop and make known its plans and targets for improving the achievement of Māori students. Each board of trustees, through the principal and staff, is required to implement its curriculum in accordance with the priorities set out in the National Education Goals and the National Administration Guidelines. These requirements will be confirmed by notice in The New Zealand Gazette. This diagram shows how curriculum levels typically relate to years at school. Many students do not, however, fit this pattern. They include those with special learning needs, those who are gifted, and those who come from non- English-speaking backgrounds. Students learning an additional language are also unlikely to follow the suggested progression: level 1 is the entry level for those with no prior knowledge of the language being learned, regardless of their school year. 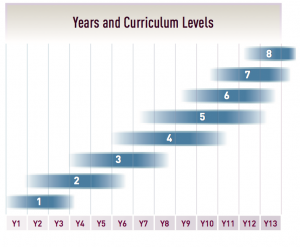 The print version of The New Zealand Curriculum has fold out charts that group achievement objectives by level. This format facilitates cross-curricular collaborative planning and assessment. The achievement objectives are also available in a format that sets them out by levels within learning areas. In some cases this second set of charts provides additional information. These charts can be downloaded using the links at the bottom of this page. The life force and the sacred energy of man. Tears and mucus are the spiritual expressions of feelings. My language is my greatness, my inspiration, that which I hold precious. Ko te reo Māori te kākahu o te whakaaro, te huarahi i te ao tūroa. The Māori language is the cloak of thought and the pathway to this natural world. Language is the life force of Māori. our canoe will never reach the shore. 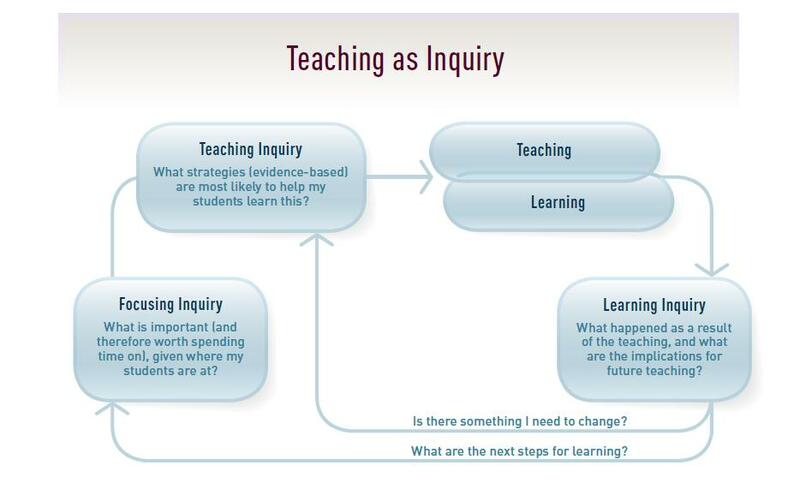 The diagram Teaching as Inquiry is based on the work of Drs Graeme Aitken and Claire Sinnema of Auckland University. The schematic view of The New Zealand Curriculum, Teaching as Inquiry, Key competencies: cross sector alignment, and The Education Act and the curriculum diagrams are by Luke Kelly. 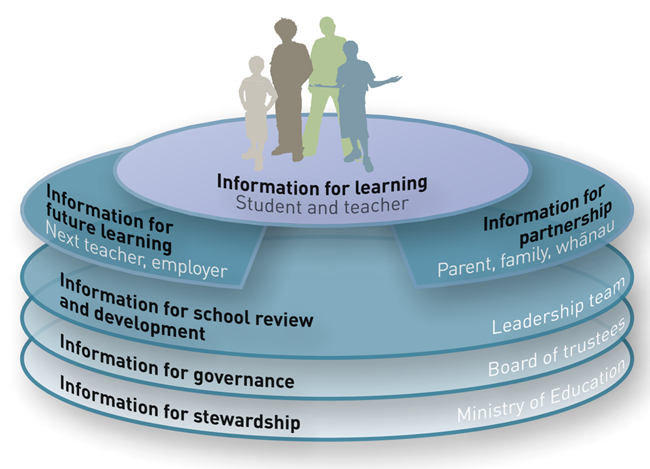 The image in the Vision section and the diagram Uses of assessment information are by James Kirkus-Lamont. The tohu designs associated with each learning area are by Phillip Paea. The image in the Vision section is used courtesy of the Image Science & Analysis Laboratory, NASA Johnson Space Center © NASA. Design of The New Zealand Curriculum publication is by Penelope Newman. Since it first appeared on the cover of The New Zealand Curriculum Framework in 1993, the nautilus has become a familiar symbol for the New Zealand Curriculum. It reappears in this curriculum with a new look. In real life, the nautilus is a marine animal with a spiral shell. The shell has as many as thirty chambers lined with nacre (mother-of-pearl). The nautilus creates a new chamber as it outgrows each existing one, the successive chambers forming what is known as a logarithmic spiral. This kind of spiral appears elsewhere in nature, for example, in sunflower and cauliflower heads, cyclones, and spiral galaxies. It is as a metaphor for growth that the nautilus is used as a symbol for the New Zealand Curriculum.